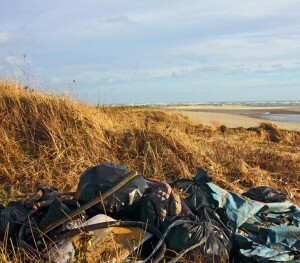 Following the storms of early January, many stretches of the coast were littered with rubbish washed in from the sea. Particularly badly hit was the stretch of beach around the Poolbeg towers. With Dublin City Council’s resources over-stretched by the impact of the storms, a group of local volunteers, led by Sandymount resident Catherine Devitt, rolled up their sleeves, donned rubber gloves and stepped in to clean up the beach. The raging storms of January 5th and 6th left the beach in a sorry state so, on Tuesday 7th Devitt resolved to improve the situation. “Originally there were just two of us but a third lady, who isn’t from the area but regularly walks along that stretch, joined in once she saw what we were doing,” Devitt tells NewsFour. Plastic bottles accounted for most of the rubbish cleared from the area. “We’re all very reliant on plastic and so much of it does end up in the sea,” Devitt says. Some of the rubbish collected was less predictable (fire extinguishers, hair brushes, clothes) while some constituted a disturbing health risk (lots of syringes, even sanitary towels). Devitt has now established a group and plans to hold a cleanup session on the first Saturday of every month, between 11am and 1pm. Above: Debris along the coast. Photo courtesy Catherine Devitt.